As much as I love making food and cocktails at home to share with you; I have to admit that operating a food blog does provide some perks that I really enjoy. I get invited to a lot of Press events as blogs are considered part of the news media and while they’re always fun, some are more exceptional than others and a story about the event will often find their way into a blog post. 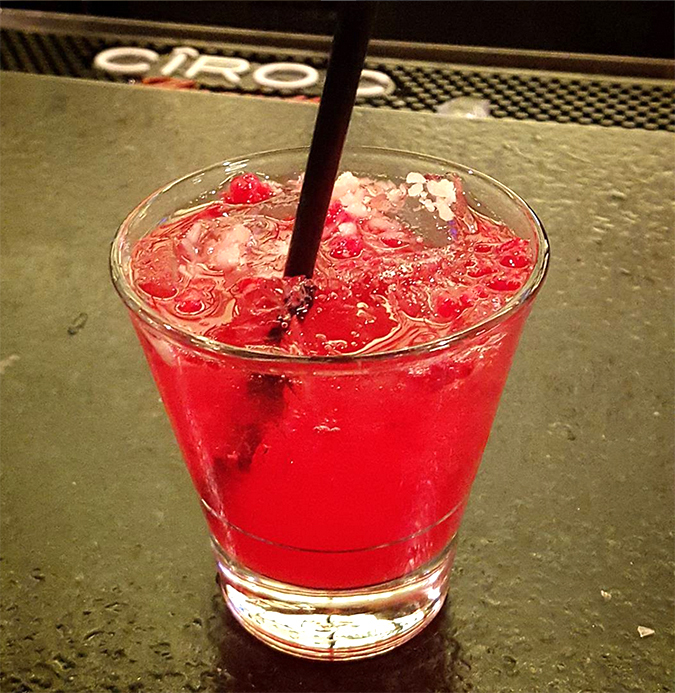 This past week was one of those exceptions when I was invited to 1515 Restaurant to sample their menu and get acquainted with Rewind, their newly renovated and reinvented downstairs bar space. 1515 Restaurant has been a staple of LoDo (Lower Downtown Denver) for almost twenty years but they have done a great job of melding with the 21st century in their use of molecular gastronomy and classics made with Colorado Spirits including this Basil Old Fashioned. What we didn’t expect was how much we would both love the Basil Old Fashioned. So unique and yet so warm and earthy too. Amy will be the first person to admit that when we met she probably gave me the crossed fingers sign when I suggested she try a bourbon cocktail I had made. That she has come full circle is exciting because I love bourbon. What made the difference for her? I can’t say for sure but my experience has been that all too often bartenders over-pour the hard stuff; they want to charge $10-$14 per drink and I guess making it strong seems a part of the package. I’m lighter on the pour; I want to be able to taste the components and not have a cocktail that is so over the top heavy with the booze component that everything else is lost. And the folks behind the bar at the Rewind Lounge got it right; this cocktail is so many things. Elegant, sophisticated and both Old World and new at the same time. Definitely a sipping drink and one worth finally popping for one of those new-fangled ice ball makers. No, you don’t have to spend a fortune for a fancy machine, this little gadget works fine for me! 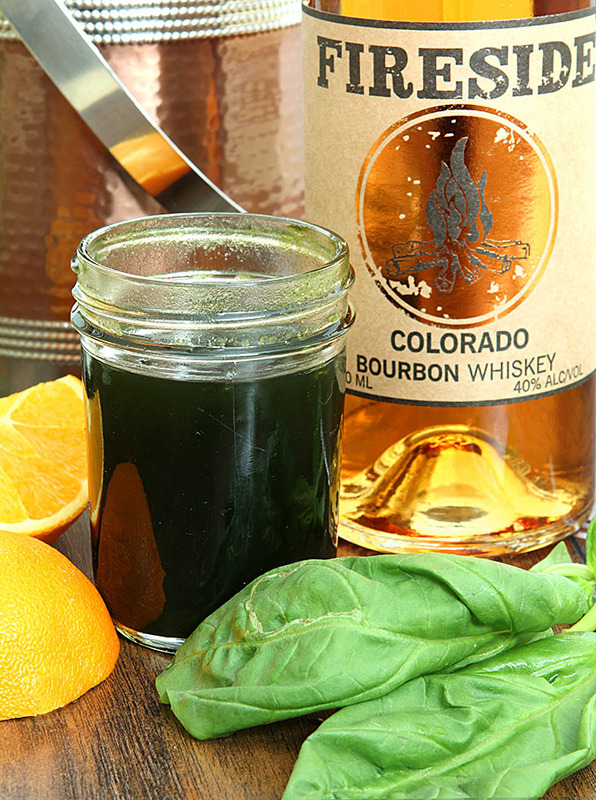 I’ve made other cocktails with herbs so using basil was no big surprise and it is just perfect with Colorado’s own Fireside Bourbon Whiskey and both orange bitters and muddled orange segments. The owner of Mile High Spirits, a Denver Distillery, was at the event with us and I was lucky enough to commandeer a bottle from Adam…which really means I begged for a bottle so I could make this drink. Bless his heart he left the event, ran to his shop and came back with a bottle of the bourbon and another of the vodka we enjoyed that night…a man after my own heart! The Fireside Whiskey is a 4 year aged Straight Bourbon that is fantastic. Extremely smooth yet it still maintains all of the robust flavor gained from aging for more than 4 years in brand new white oak barrels. Its flavor and finish are second to none and I’ll agree with other reviewers that Mile High Spirits has perfected Colorado Whiskey. It’s only available in Colorado and is at most of the larger shops in Denver but if you’re out of state and want to try this cocktail you won’t be able to find the Fireside but do make sure you use a good bourbon. Mile High Spirits also has a tasting room at their location at 2201 Lawrence Street in downtown Denver; if you’re local you should get down there stat; I know Amy and I plan on it! Before the night was over we tasted several delicious dishes including Buffalo Mozzarella, Scallops, Wagu 7X Beef, Fish en Papillote (fish in parchment paper); a lovely salad with balsamic pearls and a beautiful Cherries Jubilee. While the upstairs is fine dining; the restaurant has no hard and fast rules; overflow might find patrons in the bar too! We met the owners Executive Chef Gene Tang and his wife Paula and they were so gracious. Gene hails from Hong Kong and came to the US to pursue a degree in Hotel and Restaurant Management at the University of Denver. It was here that he met and settled down with Paula who is originally from Taiwan. 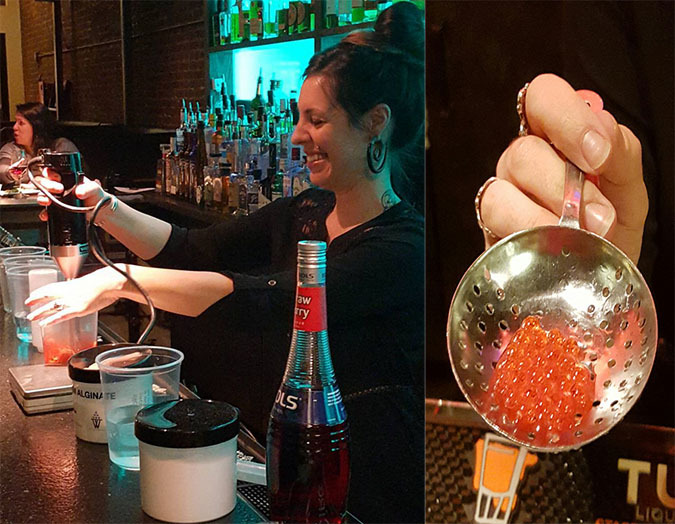 We also had such a great time with Rena who not only showed all of us how to make our own pearls for a Strawberry Champagne cocktail but sent us each home with some Tapioca Maltodextrim to try it in our own kitchen. Hold on…I’ll probably do it! Rena used strawberry liqueur for her pearls but we both thought that Creme de Menthe would be fun too. If I get them done and don’t blow up the kitchen (just kidding!) I’ll share in a post how to do them at home for your cocktails too. Deal? By the way, today is the start of the final weekend of Denver Restaurant Week when restaurants all over the city offer a special menu for just $30/person. I loved Rewind and I know with great cocktails, fantastic food and a friendly and adventurous staff that unwind is what you’ll be able to do. The food was fantastic; the atmosphere warm and friendly and well, obviously the cocktails were big winners. Do try this cocktail at home but if you’re in Denver and looking for a nice place to dine or just enjoy a great cocktail; be sure to stop by 1515 Restaurant; you won’t be disappointed. How pretty is this car? 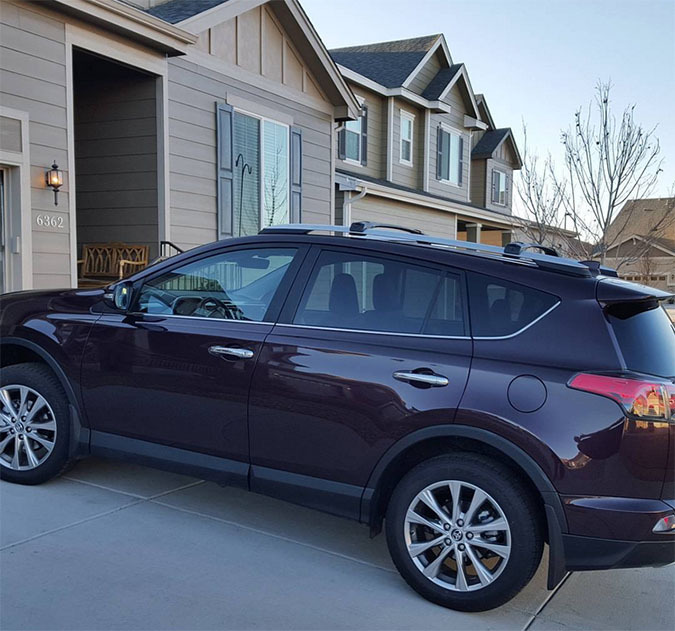 I was offered a new Toyota Rav4 to drive during Denver Restaurant Week and I did not say no. I will say though that I maybe should have taken the guys up on their offer to show me some ‘stuff.’ Luckily Amy has a new and similar car so she came to my rescue…else I might never have managed to remove it from the street. These cars have a bazillion bells, whistles and warning lights but I’m thinking they need to have one now that says, ‘Place Foot on Brake in Order to Start the Push Button Car.’ Yep, that would have helped! I am so dang tall that I think I could always use more leg room but we managed; thank you Toyota for having an adjustable steering wheel…or I might not have! I’m gonna miss a week of new car and great food smells…you bet I’ll be back next year! Boil water and sugar until sugar is dissolved; remove from heat and let cool for at least a half hour. Put the simple syrup and basil into a blender and blend until the basil is very fine. Strain mixture and store in a jar kept in the fridge. Good for one month. Put the orange wedge and the orange bitters into a cocktail shaker. Muddle until the juice is released from the orange. 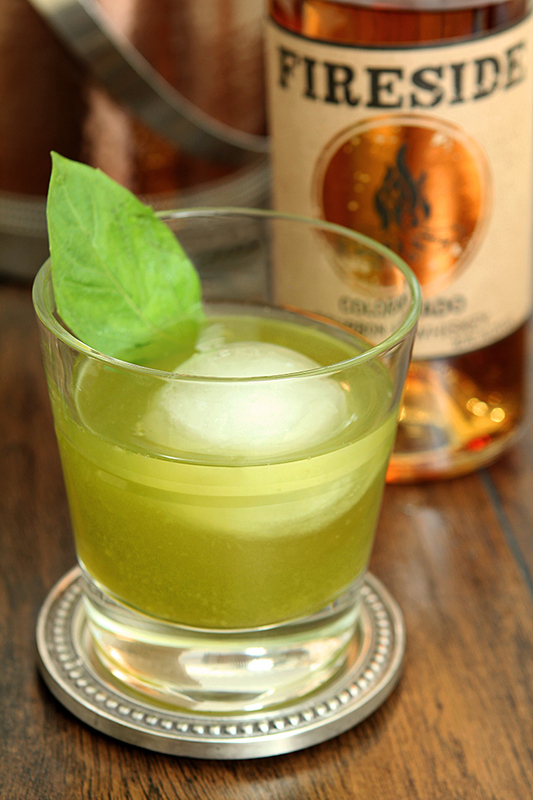 Fill the container with ice and then pour the bourbon and basil simple syrup over the ice. Stir well and strain over an ice sphere. That basil old fashioned reminds me of something my mother made when I was in high school. I tasted it and instantly thought it belonged in the kitchen. My older, more developed palate would love this. The car is a dream – lucky you! I have been wanting to find a new drink recipe and this one sounds just right. Can’t wait to give it a try this evening. Sounds like a fun time! And sounds like a great drink, too. I’m counting the days until I can plant basil — won’t be long. 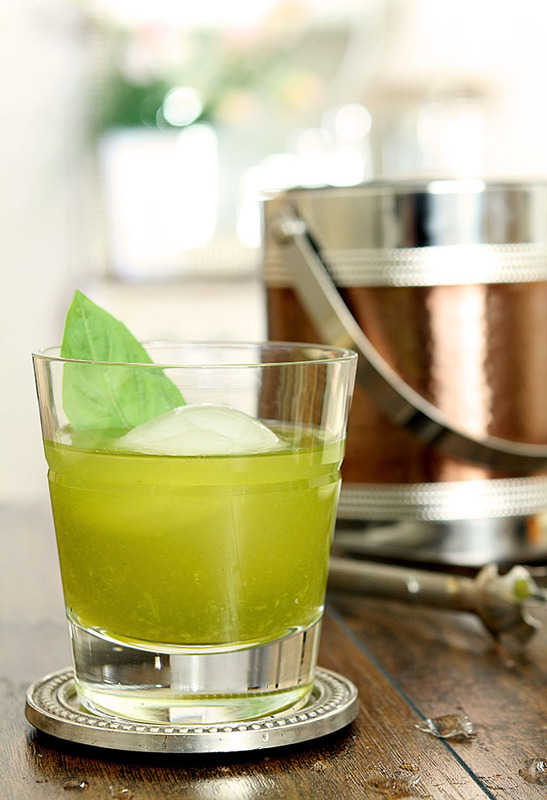 Love the idea of making my own basil simple syrup!